Q to Councilman, “How ‘Bout a New Protest [Street] Fee?” The Answer Will Make You Snort. 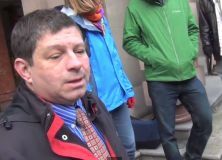 Laughing at Liberals asks Portland City Councilman Steve Novick about a protest fee and why he was detained at protest. You have to remember, liberals aren’t as smart they think they are. Just look at the reactions to these questions by citizen journalist Laughing at Liberals to Steve Novick. Novick channels his inner Randy Leonard, whose classic response to any disagreement would be to ask, ‘Why do you hate ___?‘ to parry the questions. The I-can’t-believe-you’re-that-stupid reaction by Novick is classic. They don’t know how to answer a question because ..um…um..um… people will die! The citizen journalist asks Novick about the Portland Street Fee and arresting reporters at the protests. Please note Novick’s consigliere Dana Haynes (Charlie Hales’s spox) who absurdly tries to square off with L@L.